Where did the idea for iRule come from? The idea for iRule came when I wanted to upgrade my control system due to constant upgrades. The costs of the available systems were higher than any other component I already owned. It was just cost-prohibitive to get the control system I wanted. When did you realize iRule could be more than a hobby/side project for you? iRule started as a great hobby to solve my problems and the same problems for my fellow home theater enthusiast friends. I realized iRule was more than a hobby when we started to sell every day and DIYers and professionals alike were buying the product. Can you give us a typical setup procedure and cost breakdown for an iRule universal remote control system? Setup is easy using our cloud-based Builder application and Handset Wizard. Answer questions about which kind of handset you want to create, what activities will be used in the system, which devices are used in which activities, and which devices control volume and input selection, and iRule Builder does most of the work. You can create a single-room remote in under 10 minutes, then customize from there. Cost varies by install, but is typically around $200-300 for both software and hardware in many single-room installations. How does the signal get from the iPhone to the device it is controlling? iRule uses the home's Wi-Fi connection to send the command from a phone or tablet to the IR converter or a network device. This happens in a fraction of a second. Is there a time delay with the iRule system that I wouldn’t experience with a universal remote? The beauty of the system is that a command normally executes in about 150ms which is as fast or faster than many of the standard remotes we are using today. We spent a lot of time optimizing the commands and system to be efficient and very high performance. How many home automation systems do you currently support and what do I need to control my home system? iRule supports dozens of different automation systems from all around the world. 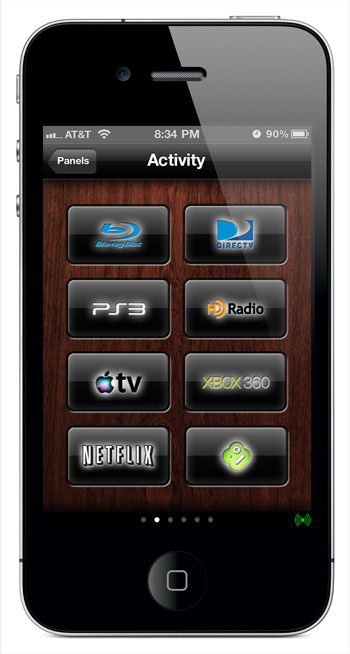 We work with the major players and are always adding more systems and devices to iRule for additional compatibility. Most automation systems that are sold support a third-party control system and we are able to interface with them. You have sold iRule all of the world – what has the feedback been like from those who have incorporated into their lives? The feedback has been amazing! I am always fascinated by how people from all over the world have many of the same needs and are trying to solve the same problems. Most of us have families with wives, kids, in-laws, and babysitters and are trying to create a great experience for everyone in the home to enjoy the automation and electronics. With our recent advancements into home automation, many users are asking for a better way to cloud-enable their home automation system. Many customers are facing issues with existing systems and the inability to control systems from outside the home without advanced networking skills, so we're going to make that easier. We are also expanding into much larger projects with our commercial customers. It's amazing to see a solution where an iPad is controlling 350 TVs in a sporting arena.